One of two "Harlow" biographies in 1965. 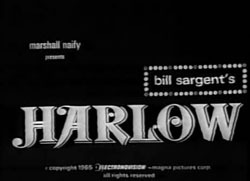 Jean Harlow, a bit player in Laurel and Hardy comedies, is invited to test for director Jonathan Martin for the lead in Howard Hughes's "Hell's Angels." She is an instant sensation, and in a series of films devoted more to her body than her talent, she becomes Hollywood's Platinum Blonde.